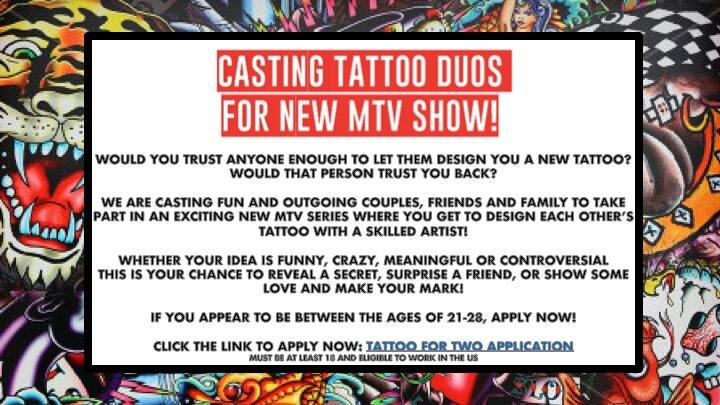 MTV is casting for a tattoo show and on this one they want pair. Do you trust another person to design a tattoo for you? How about a person that you know such a friend, loved one or family member? If you have been looking to get a tattoo and have another person to do it with you, read on…. -WOULD YOU TRUST ANYONE ENOUGH TO LET THEM DESIGN YOU A NEW TATTOO? WOULD THAT PERSON TRUST YOU BACK? -WE ARE CASTING FUN AND OUTGOING COUPLES, FRIENDS AND FAMILY TO TAKE PART IN AN EXCITING NEW MTV SERIES WHERE YOU GET TO DESIGN EACH OTHER’S TATTOO WITH A SKILLED ARTIST! -WHETHER YOUR IDEA IS FUNNY, CRAZY MEANINGFUL OR CONTROVERSIAL THIS IS YOUR CHANCE TO REVEAL A SECRET, SURPRISE A FRIEND, OR SHOW SOME LOVE AND MAKE YOUR MARK! -IF YOU APPEAR TO BE BETWEEN THE AGES OF 21-28, APPLY NOW! Hi I’m 37 years old. I know the show about the tattoos said look between 21 – 28 but I would love to be a part of this show. I love the concept of it and the thought of leaving a mark on one of my friends or wife make me laugh. I have a great sense of humor bordering on the taking things a little to far but would love to have a spot on this show if at all possible. Thanks for your time look forward to hearing back from you.